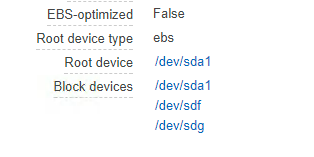 So we have an EC2 instance on AWS. But we need to terminate it as the project has to give way to something urgent and therefore not on foreseeable future will it be used. So instead of accruing cost, (as an image cost something if its in AWS although it is not being used), we decided to download the image or drive directly on our drive and store it. Create a snapshot of the existing image you want to download in AWS. From that snapshot, create an image. Once the image is available, add that image as part of the EC2 Instance you wish to download. Mount it as part of the EC2 Instance. /dev/sdg will contain the backup. For /dev/sdg, the mountpoint is xvdg. Once created, go to /mnt/image and do a tar/gz. This is to compress it. After which, you can now do an SCP to the machine and download the file. When updating MacOS High Sierra, you may experience this issue, where a couple of hours, you will be presented with an error Disk Management Error 0. Make sure you are connected to wifi or network. Once done it will take you back to normal recovery mode. Run First aid on the disk you want to install to. Once converted, click on Reinstall MacOS. It will prompt you to install High Sierra. Then proceed to install MacOS High Sierra. All my files and applications are still there. And it worked. Well, do make sure you have a backup before attempting to install High Sierra. My current work nowadays involves a lot of multi-threading application. And also a lot of simultaneous users. We need to serve them fast (as in milliseconds fast), that's why some of our apps and services uses threads to provide the data very fast and also do most of the things in parallel. We had issues before where an application keeps on dying without any logs. This would be because of the threads dying even if we have exception handling. We can't seem to understand and the only clue we have is the event viewer saying something died. So I kept on searching a solution and found it here : http://blog.functionalfun.net/2013/05/how-to-debug-silent-crashes-in-net.html. This is applicable from windows vista and up. 2. Once done, and your app crashes, it will create a *.dmp file onto the folder you specified. Get that file and open it on your visual studio. I find that you need to put the DMP file onto the folder where your application, DLL and PDB files are located. 3. You will see the screen below. Click on the Debug with Mixed and it will go to the line where the offending application stopped. Voila!, you know now which portion of the app made your application crash. Copyright by Me.. Watermark theme. Powered by Blogger.